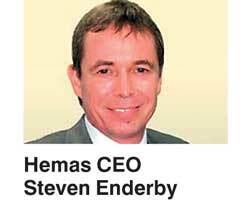 Hemas Holdings PLC (HHL) and its subsidiaries have achieved consolidated revenues of Rs. 37.9 billion, a year-on-year (YoY) growth of 16.9% for the 12 months ended 31 March 2016. During this period operating profit reached Rs. 4 b and earnings Rs. 2.7 b, growth of 17.5% and 37.7% respectively. An additional interest income of Rs. 280 m was earned from investing the proceeds of the rights issue. The FMCG sector achieved total revenues of Rs. 14.3 b for the 12 months, a 20.2% YoY increase over the previous financial year. Operating profits were Rs. 1.8 b, 50.5% YoY growth, whilst earnings grew at 37.2% to stand at Rs. 1.4 b. Overall healthcare sector revenue for the 12 months under review stood at Rs. 16.1 b, a YoY increase of 16.0%, whilst earnings grew at 22.8%. During the year, Hemas Hospitals opened its first wellness centre at Orion City, three new laboratories and invested in building capabilities in the urology specialty. Its hospitals growth in revenue contributed 34.7% of the overall segment’s revenue growth. Hemas pharmaceutical distribution operation registered a YoY topline growth of 8.2% maintaining its market leadership position. Its pharmaceutical sales growth continues to be driven by its strong presence in growing therapeutic segments. JL Morison posted a YoY growth of 22.8% and earnings growth of 43.4% for the twelve months ended March 31, 2016. Revenue growth was largely driven by the increase in sales from the buyback arrangement with Government of Sri Lanka and sales growth in key diagnostics agencies. The significant growth in operating profit resulted from increases in revenues in both consumer/OTC products and pharmaceutical segments, efficiency and capacity gains at the plant after a period of closure of the plant in Q1 2014/15 and a restructured distribution network. Transportation sector reported a revenue of Rs. 1.8 b, a 17.2% YoY topline growth. “Revenue growth was driven by higher volumes through our domestic logistics operation with warehouses operating at high levels of capacity, higher volume throughput at our container depot and new 3PL customers, specifically Hemas Logistics was able to secure a warehouse and distribution agreement for Sathosa. GSA businesses continued to experience challenges from lower yields of ticketing income. With subdued revenue growth from the aviation segment, the transportation sector registered an operating profit of Rs. 499 m, which is a growth of 8.2% over the previous year,” said Enderby. The leisure sector recorded a revenue of Rs. 3.4 b for the 12 months ended 31 March 2016, a growth of 13.0% over the previous year. “Our newest property, the luxury hotel Anantara Peace Haven Tangalle Resort, opened in December, finished its first operating quarter with encouraging performance. Serendib Hotels posted a revenue growth of 12.2%, driven by strong performance from the popular Dolphin Hotel which recorded year-round occupancy of 83%,” added Enderby. In technology, N-Able posted a YoY revenue growth of 16.1%, despite the revenue growth, earnings were impacted by project delays and high operational leverage. “We continue to focus on driving growth from our core Consumer and Healthcare businesses while seeking continuous innovation, and strong profitability for the year ahead,” concluded Enderby.